Another Top Elite Sounds the Warning. Is Anybody Listening? A regular feature of our selections has consisted of articles in which leading financial elites warn of coming collapses and dangers. We’ve featured such warnings from the IMF’s Christine Lagarde, Bridgewater’s Ray Dalio, the Bank for International Settlements (known as the “central banker’s central bank”) and many other highly regarded sources. Jones does not treat the possibility of a financial crisis lightly, so his warning deserves close consideration. 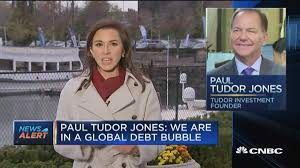 In this article, Jones warns that the next crisis is likely to be triggered by excessive debt, specifically corporate debt, which can be more difficult to manage or bail out than sovereign debt.